Napoli's Marek Hamsik enjoyed a memorable return to his former club Slovan Bratislava, scoring one and creating another, in a 2-0 victory on Thursday as the Italians joined five others who made it two wins from two in the Europa League group stage. With the incentive of Champions League qualification for the competition winners, Fiorentina, Legia Warsaw, Dynamo Kiev, Inter Milan and Dynamo Moscow also took a stranglehold on their respective groups and edged a step closer to the knockout stages. Holders Sevilla needed a 90th-minute equaliser from Stephane Mbia to rescue a 2-2 draw at Croatian side Rijeka, while it was a disappointing night for former European champions PSV Eindhoven and Steaua Bucharest, who both suffered defeats. Two other former European Cup winners fared better, however, as Celtic beat Dinamo Zagreb 1-0 and Feyenoord won 2-1 at home to Standard Liege, which could prove a good omen as the last time they beat the Belgian side they went on to lift the continent's second-tier trophy in 1974. After the opening round of matches provided a shower of goals and entertainment, Thursday's action showcased the more measured and tactical side of European football. Hamsik began his professional career at their Slovakian opponents but showed no sentimentality when he headed his side ahead in the first half and then set up substitute Gonzalo Higuain to double the lead with only his second touch after the break. Napoli's Serie A rivals Inter Milan also enjoyed a comfortable victory, bouncing back from a chastening 4-1 home defeat by Cagliari at the weekend to beat Azerbaijani champions Qarabag 2-0 in Group F with goals from Danilo D'Ambrosio and Mauro Icardi. It was, however, a more trying evening for champions Sevilla, who needed Mbia to ride to their rescue in their Group G clash having been reduced to 10 men in the second half. The Spaniards took the lead through Liverpool loanee Iago Aspas, but Timothee Kolodziejczak was sent off for bringing down Andrej Kramaric, who fired in the resulting penalty and Zoran Kvrzic then put the hosts 2-1 ahead. There was late drama involving Premier League sides Everton and Tottenham Hotspur. Everton, who had enjoyed a victorious return to the European stage after a five-year absence on matchday one, were spared defeat against Russian side Krasnodar in Group H when Samuel Eto'o scored a late equaliser in a 1-1 draw that left manager Roberto Martinez feeling positive. "You always want six points after two games -- that's what you're fighting for. But today, that's a good point," he told ITV. Tottenham gave an indication of where the competition ranks in their priorities by making 10 changes to their team, but still came within minutes of beating Besiktas in a 1-1 draw. 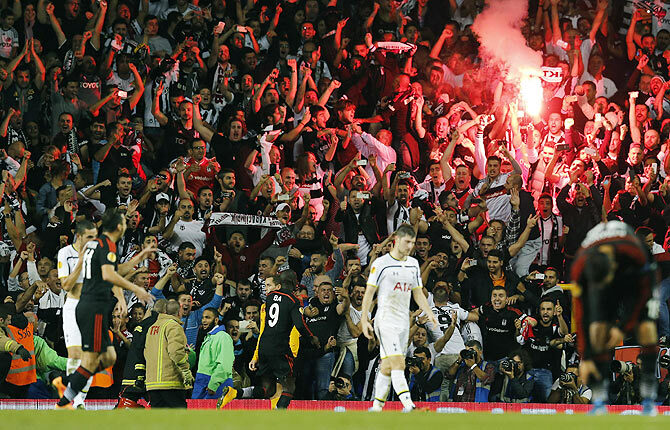 The Turkish side, who were making a return to north London after losing to Arsenal in a Champions League playoff, trailed to a superb left-footed strike from Tottenham's Harry Kane, but were handed a lifeline late in the game. Vlad Chiriches handled in the area to concede a penalty and former Chelsea and Newcastle United striker Demba Ba scored from the spot past Tottenham goalkeeper Hugo Lloris, who had been a one-man barrier until that point.